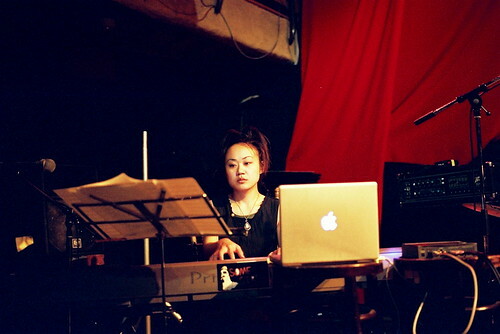 Midori Hirano is a piano player and composer who creates an assemblage of dreamy, beautiful, lush and layered sound using a combination of keyboards, computer manipulation, and live instrumentation. The first time I saw Midori play was with RF at Urban Guild in Kyoto. Since that show was so good, I was really looking forward to seeing her play again at Rain Dogs, one of my favorite places in Osaka to see live music. Midori’s new album, LushRush, is incredibly gorgeous; in fact, it’s one of the most gorgeous albums I’ve ever heard. This, of course, makes it hard to describe, though I’m definitely reminded of RF, but also of Múm. The viola and the cello weave a melodic standard while clicks and liquid drops move around in the soundstage like some kind of creatures in an enchanted musical forest. Then, off in the distance, the most soft and beautiful voice starts to sing from the edge of the woods while phantom piano notes spread around and through the music like a cloak. Crescendos arrive, but as a lifting feeling from within the music that creates the sense that you’re rising vertically above a groundscape. I realize that my description of LushRush comes dangerously close to approaching the scandalous late-19th century practice of reading classical music as a kind of aural technology for the ‘more important’ work of producing images in the mind (“Beethoven? Oh, he always makes me think of castles and storms!”), but I’m only trying to give some kind of impression of the precise and flowing minimalist complexities of Midori’s work. The artwork on the CD features a dragonfly perched silently on some sort of grass-like plant that’s disintegrating upwards into empty space. This too is an apt image for Midori’s soundscape imagination. Midori and Marié’s set at Rain Dogs obviously had a much more stripped down sound than the deep layerings of LushRush (that’s what happens when you’re four musicians down), but they ended up playing a series of spare and minimal arrangements that reminded me of the beauty and simplicity of spheres and orbital motion. The beauty of a space that contains only a few objects in motion is that you can watch each one as it arcs slowly through its rotations, and you can see the relations that form between ellipticals. Midori’s keyboard and computer galaxies, a quiet motion through time, worked perfectly in conjunction with Marié’s chordal, nebular, stellar, accordion playing. 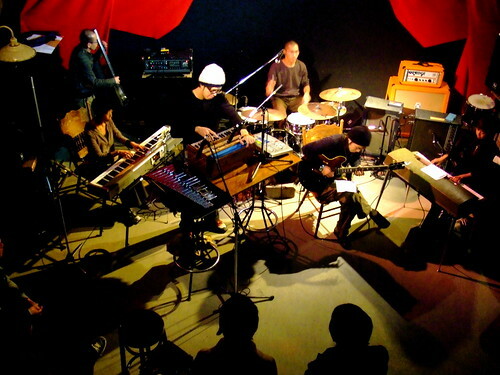 Yasushi Yoshida‘s group also played at Rain Dogs, along with Miaou and Tracer AMC. 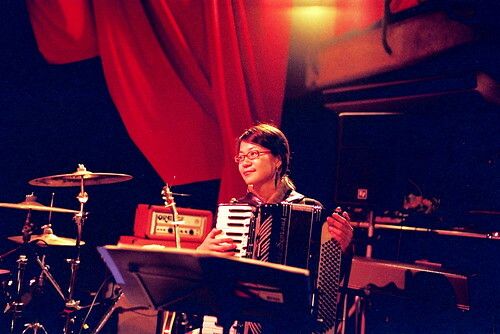 Yoshida’s music is also a kind of minimalist, layered meditation on sound and includes slow reverse-language computer loops, bells, harmonics, languid guitar streams, and the harmonium. But the music doesn’t stay quiet — instead it builds up into a massive, room-filling juggernaut involving drums, a loping and full bass sound, and two keyboardists. One of the coolest things about this unit is that the bass player, who I think is named Tanaka Yasukata, built his own bass — a fretless standup that floats in the air at the end of a kind tempered metal leaf-spring. So cool. Miaou, who are from Tokyo, were also great. More guitar-oriented than Yoshida’s unit, the members of Miaou were so clearly reveling in playing that they were a joy to watch. A lot of musicians who play the kind of looping music that Miaou plays often become engrossed in the waves and rhythms of the music like a kind of meditation, but Miaou was pretty much rocking out. Maybe it was the giant orange amplifier that they brought with them. Beautiful big pop basslines, scattered chandeliers from the guitars, the kind of rhythms that you feel in your legs when you’re happy and dancing just a little bit for yourself, even though you’re alone. This is the soundtrack for a movie in which I play the main character, who just happens to be in love. The final band of the evening was Tracer AMC who, and I hesitate to make the comparison because they must hate it, sound a lot like Mogwai. But, just to poke at the comparison a little bit, let’s say that they sound a lot like Osaka’s own Naazi instead. In any case, Tracer AMC blend beautiful guitar harmonics and spare melodic lines with oceans of distortion and feedback in a kind of back-and-forth between really really soft and pretty and really really loud and enormous-intense. But what I really liked about Tracer AMC is that every once in a while they would bust out with a few licks that were right on the edge of the metal tip and just let it rock before moving back into mathhead/shoegazer mode (neither of those adjectives is intended to be negative! ).